When you fall in love the minute you see it, you can imagine using it for this and for that – you must buy it. Too many times I’ve walked away from idea items and truly regretted this. Every now and then you just have to go for something when you are not planning to buy, just because… it feels so right. 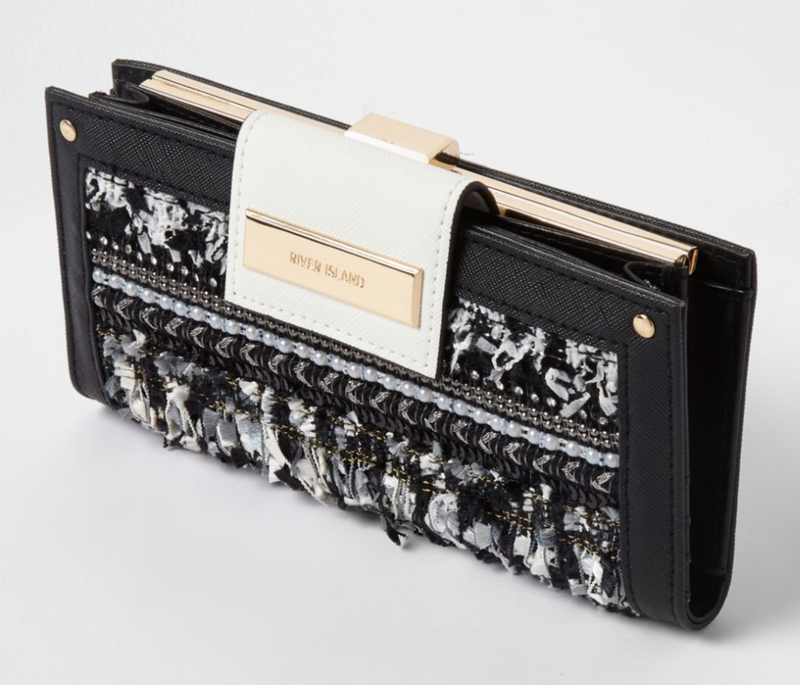 Chanel designs are typically monochrome, typically tweed mixed with leather – and so this collection from River Island really mimics the design ethos of the Chanel brand. 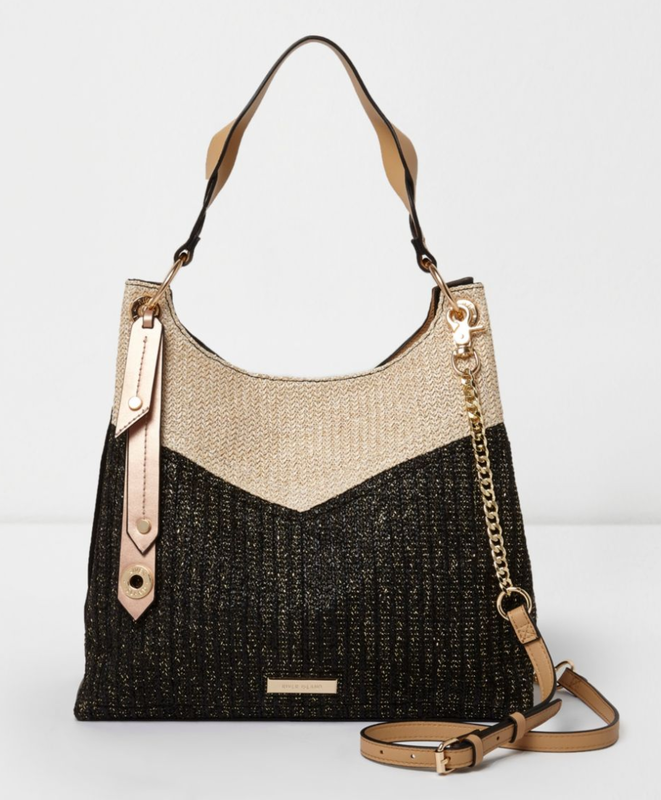 And so with this cross-body bag seen in store and bought – I am in love! I’ve been using it now just over a week and I’ve had so many compliments! I won’t deny you may need to reconsider if you have a large purse but on the whole it has lots of compartments therefore helping you to organise your items – it’s really helped me reduce what I carry each day, and the lighter load has been lovely! I think this is a fabulous price at £32, I would say it looks more £50+. 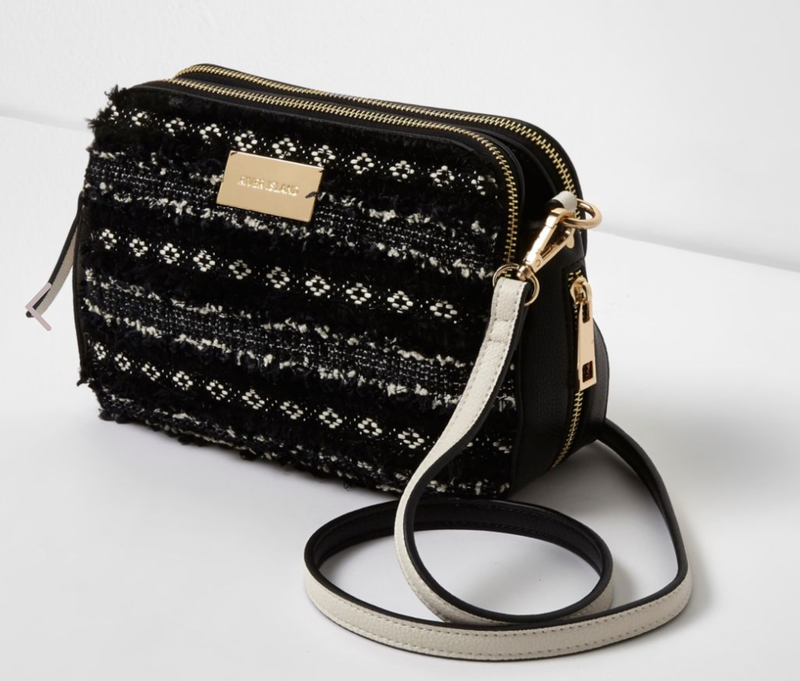 This is the matching purse, however I noticed in the collection that they had some others that are more slimline that complement this range, which are a great alternative especially if you don’t want matchy-matchy. 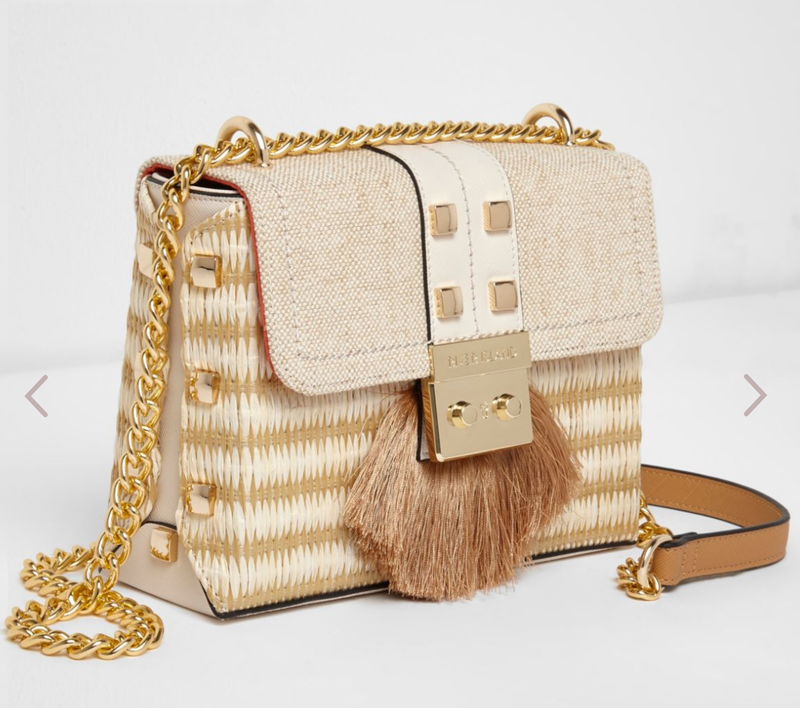 If you are looking for a bigger bag, then I would opt for this one – again I can’t believe the price. The finishes like the zip pulls or the gold chain etc of each item are similar and so this easily allows you to swap between items easily. So for example, if you away for the weekend, you could travel using this slouch bag to get lots of stuff in, but use the cross-body bag above in the evenings when you want less items with you. 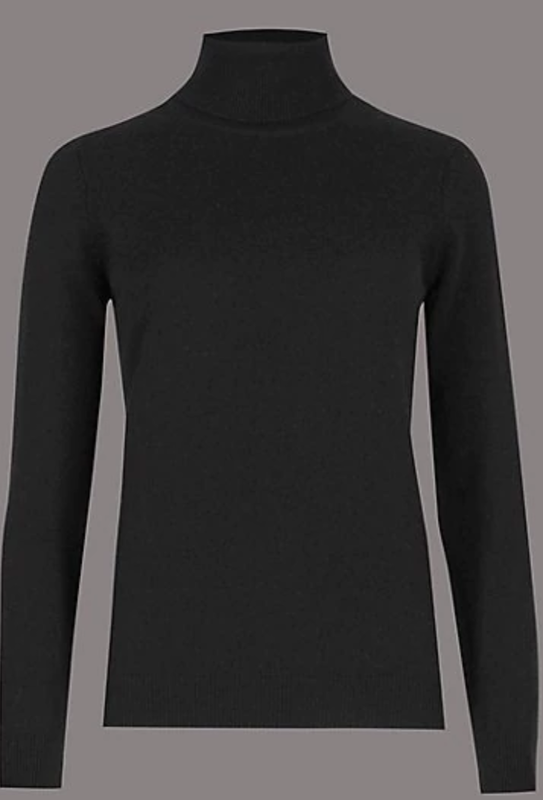 This is a fabulous option if you want to avoid black and perfect for summer outfits – all very natural and would easily work with multiple colour schemes, especially if you teamed this with tan sandals. The fringing too will keep you on trend too for 2018. 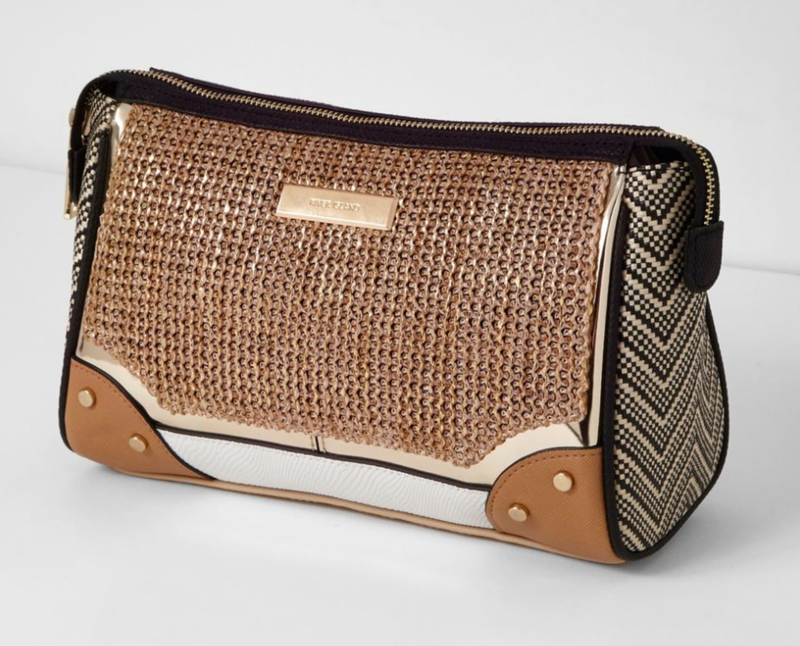 They’ve put this as a make-up bag online, I would perhaps say it’s a tad big for that. When I was hands-on with it, I felt this was a wash bag ideal for all your bathroom essentials – it has a lining inside to protect the outer fabric from small spills. I loved this – and as its neutral in colour with such a great price-point, this would make a fabulous gift to any women of any age – so if you have any birthdays coming up or maybe even Mother’s day – this would be spot on! I don’t generally use vanity cases, especially not whilst travelling – but it’s nice that they have included something like this in the range, it would a personal preference item, but classy nonetheless! I WANT THIS WEEKEND BAG!!!! This is on MY HIT LIST, and I can kind of justify it (she says confidently LOL!). My orange faux snakeskin weekender that I’ve had a few good years, the pull-lever has broken, and so I simply cannot use it – surely that’s reason there?! It’s fairly lightweight and I thought quite roomy for a weekend bag. But if you need the wheels, then they have thought of that too! Well done River Island, I am very impressed with this collection. Now not all stores have all the items, I’ve been in several River Island shops and you get a mix bag (literally!) I would suggest to head into your local store so you can get a feel of the style and fabric and if they are missing an item you are keen on then go online for the full collection. I know you are keen to know more about what I wear casually at the weekends, and this is probably a typical look on a low-key Saturday run-around kind of day. When I have no major plans and I need to get jobs done I always turn to my NIKES; I’ve had these over two years now and I love them! At the moment, it’s very cold and so on wet and chilly days, whilst I know most people are opting for their rain coats, I’m choosing my faux fur black coat which I’ve had for many years and my M&S black cashmere polo that was a gift this Christmas – both keep me very snug!